The Raleigh-Durham-Chapel Hill metro area is a region in the Piedmont of North Carolina anchored by the cities of Raleigh, Durham, Cary, and Chapel Hill. It is known as the Research Triangle, or more commonly "The Triangle." The "Triangle" name was cemented in the public consciousness in the 1950s with the creation of Research Triangle Park, home to numerous high-tech companies and enterprises. Although the name is now used to refer to the geographic region, "the Triangle" originally referred to the universities (North Carolina State, Duke, North Carolina at Chapel Hill) whose research facilities, and the educated workforce they provide, have historically served as a major attraction, both for businesses located in the region and for international immigrants. Anchored by leading technology firms, government and world-class universities and medical centers and schools, the area's economy has performed exceptionally well. Significant increases in employment, earnings, personal income, and retail sales are projected over the next 15 years. Predicted to be the fastest growing metropolitan center through 2025. A major education center that’s home to UNC Chapel Hill, NC State, and Duke Universities. Home to Wake Tech with a student population of 69,000. Home to the Research Triangle Park, a high-tech development zone which now encompasses 16 square miles and employs more than 39,000 people in more than 170 different companies. A popular destination for relocation from other parts of the country, especially for those coming from New York, New Jersey, Pennsylvania, and Ohio. A popular destination for those relocating from other parts of the world, especially for those coming from India, East Asia, West Africa, Central America, and Europe. 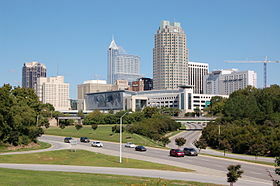 Raleigh has a sister city relationship with Xiangyang, China; Compiègne, France; Kingston upon Hull, United Kingdom; Rostock, Germany; and Nairobi, Kenya. Durham has a sister city relationship with Arusha, Tanzania; Durham, United Kingdom; Kostroma, Russia; Toyama, Japan; and Zhuzhou, China. In the first decade of the 21st century, Raleigh was featured prominently in a number of "Top 10 Lists," including those by Forbes, MSNBC and Money Magazine, due to its quality of life and business climate. Between 2000–2009, the Raleigh-Durham-Chapel Hill Combined Statistical Area (CSA) grew by 40%, making it the fastest growing metropolitan center in the USA. According to the 2012 Census, the Triangle has 237 different language groups. Politics, education, and technology combine to attract a wide variety of people to the Raleigh-Durham-Chapel Hill area from across the country and around the world. The rapidly changing context presents new challenges to existing churches in knowing how to present a meaningful gospel witness. The growth of the area along with rapid change increase both the challenge and opportunity for gospel impact within strategic geographic locations and among people groups. Raleigh-Durham-Chapel Hill has twenty-six different geographic pockets where the unevangelized population is seventy-one percent or greater. These geographic pockets represent an estimated unevangelized population of more than 310,000 people from all three major socio-economic groups. At the same time, Raleigh-Durham-Chapel Hill has representatives of people groups speaking 237 different languages from around the world. Many existing churches need revitalization and many new churches need to be planted that will make disciples who obey the Great Commandment, fulfill the Great Commission, and demonstrate a loving knowledge of the changing context. Displaying 1-25 of 30 results. International Focus - A non-profit organization with the mission to serve as North Carolina’s premier organization facilitating cross-cultural exchange and promoting international arts, business, and education. Triangle Area Chinese American Society - Their mission is to foster Chinese-American cultural exchange, promote Chinese language and cultural education, and participate in public welfare and community services. The Friendship Force of Raleigh - A membership organization devoted to building person-to-person international friendships through exchanges. Members travel as citizen ambassadors and have homestays in other countries (and domestically) to experience communities from the point of view of people living there and to develop friendships. Members also host international guests from other clubs in their homes. Ukrainian Association of North Carolina - The Ukrainian Association of North Carolina is united by the love of, an interest in and a desire to support an independent Ukraine, as well as a wish to preserve, develop and nurture Ukrainian cultural heritage and traditions as a distinctive contribution to the culture of North Carolina.